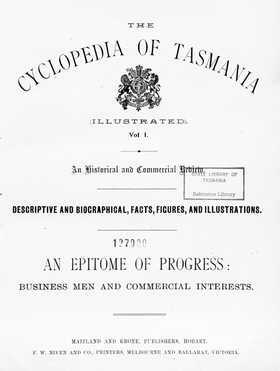 The Cyclopedias that were published for most states of Australia around the beginning of the 20th century are a vast resource of historical and biographical information. They cover the people, towns, industries, professional, commercial and social institutions and much more. The Cyclopedias include thousands of illustrations, the larger number of these being portraits of those whose biographies are included. These are not just the rich and famous, but include a high percentage of the ordinary citizens in each community. This is a terrific genealogy tool for anyone exploring their Tasmanian family history or building a family tree!